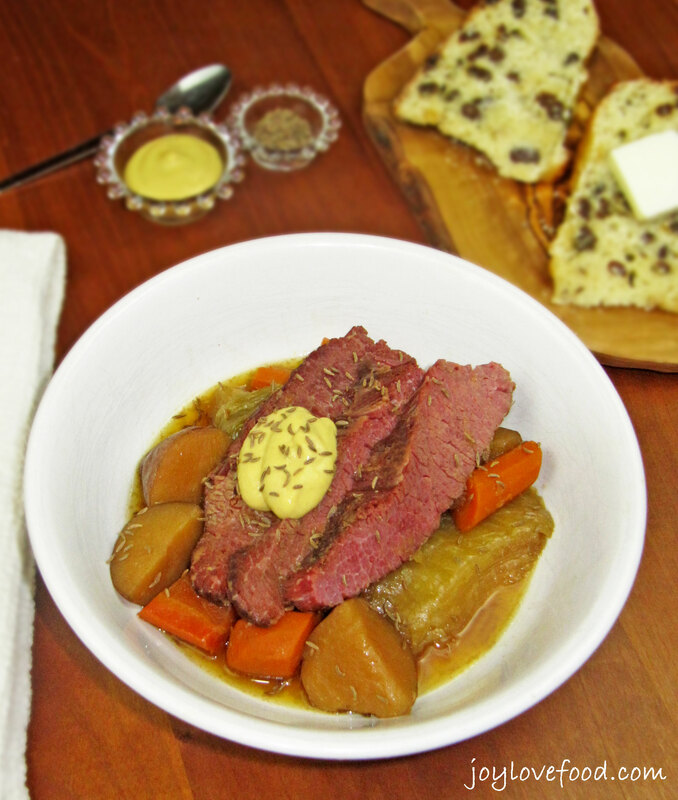 Crock Pot Apple and Brown Sugar Corned Beef & Cabbage – this easy and delicious version of the classic Irish dish is perfect for your next St. Patrick’s Day celebration or a cozy dinner anytime! 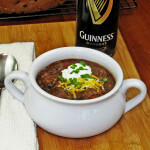 St. Patrick’s Day is next week, so I thought I’d share another Irish (or Irish inspired) recipe. Last week I shared my hearty and delicious Slow Cooker Guinness Steak and Black Bean Chili, today I have another wonderful comfort food recipe — Crock Pot Apple and Brown Sugar Corned Beef & Cabbage. My version of this classic Irish dish includes carrots, onions and potatoes, has a hint of sweetness, and is made in the slow cooker. I love corned beef, and when I came across the original version of this recipe in a cookbook, called Fix-It and Forget-It Recipes for Entertaining: Slow Cooker Favorites for All the Year Round , that my mom had given me, I knew I had to make it. The recipe caught my eye because it called for apple juice and brown sugar, which I thought would go well with the corned beef and cabbage. It sure did! The first time I made this dish, I was so delighted by how delicious and easy it was, that I made it again that same week. 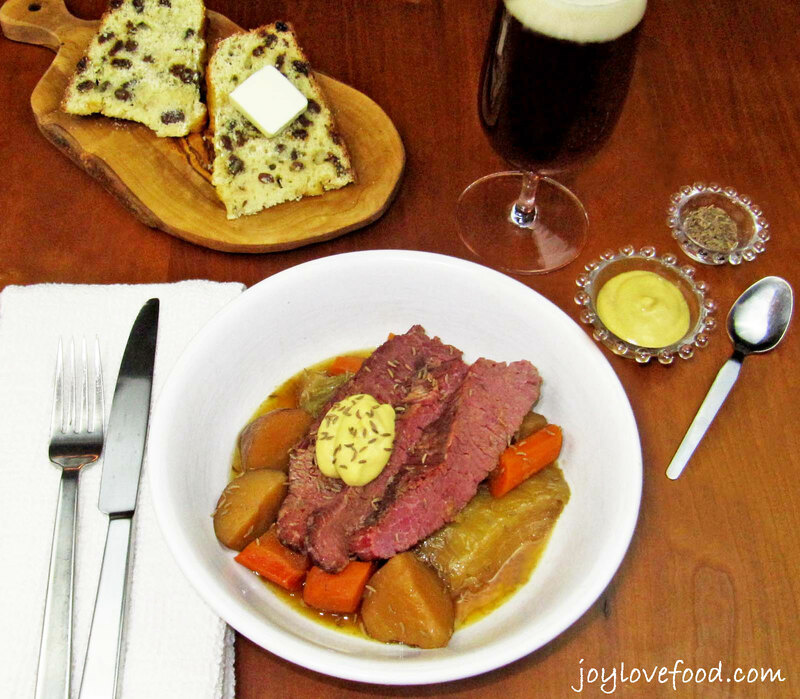 The meat and veggies are so tender and flavorful and the sweetness from the apple juice and brown sugar really complements the corned beef and cabbage nicely. A side note about the weather situation here in the Boston area — we did not break the snowfall record last week, we are short by less than 2 inches. I have to say I’m ok with that, I’m ready for this snowy winter to be over and for spring, and some warmer weather to begin. In fact, the temperatures did reach the low 50s °F here yesterday and are getting there today. Snow is actually starting to melt and I was able to go for a run without a hat or gloves, the first time I was able to do so in many months, yay! I like to serve this Crock Pot Apple and Brown Sugar Corned Beef & Cabbage with a dollop of Dijon mustard and a sprinkling of caraway seeds for a bit of tang and crunch. A slice of Irish Soda Bread with Caraway Seeds and Raisins in the perfect accompaniment. 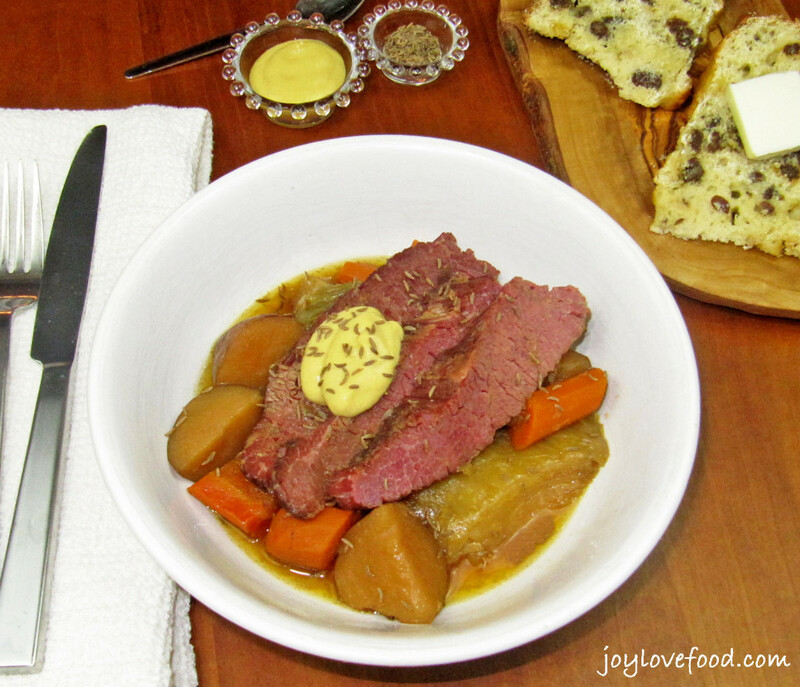 This Crock Pot Apple and Brown Sugar Corned Beef & Cabbage is the perfect meal for a St. Patrick’s Day celebration or would be wonderful for a cozy Easter dinner or a Sunday supper any time of year. Place corned beef in a 6-quart slow cooker. Add in potatoes, carrots, onion and cabbage. In a medium bowl, whisk together apple juice, brown sugar and mustard. Pour apple juice mixture over meat and veggies in cooker. Cover slow cooker and cook on high heat for 6-6 ½ hours or on low heat for 10-12 hours, until meat and vegetables are tender. Remove meat from slow cooker, slice thinly across the grain. Serve meat with vegetables, spoon some of the remaining liquid from slow cooker on top of meat and veggies, if desired. Top individual servings with Dijon mustard and caraway seeds if desired. 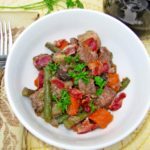 This entry was posted in Crock Pot / Slow Cooker, Main Dishes and tagged cabbage, carrots, corned beef, crock pot, potatoes, recipe, slow cooker, St. Patrick's Day. Did you use the seasoning packet that came with the brisket? Have you ever tried putting the vegetables in first and then placing the brisket on the rop? This sounds so so good!! I want to make this today. Hi Beatrice, no I didn’t use a seasoning packet. The apple juice, brown sugar and mustard flavor the meat nicely so you don’t need any other seasonings. I’m sure you could put the vegetables in first if you prefer. Hope you give this a try and enjoy! We would love your Corned Beef and Cabbage. Happy St. Patrick’s Day and thanks so much for sharing with Full Plate Thursday! Apple and beef.. great combination! I’m with you, so over winter. I wore a tank top and flipflops all weekend so it’s going to be super depressing when we get snow next week. This looks SO good – my husband would be all over it! It sounds like you have several delicious options for St. Patrick’s Day! 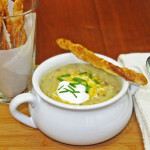 Love this version for corned beef. Holy moly that looks good! I haven’t made corned beef in forever…your recipe sounds delicious! I had no idea that you could blend apples with Beef to come out with this delicious recipe! Mmmmm…..LOVE corned beef and your recipe sounds scrumptious! I bet the leftovers (if there are any!) would be outstanding!! Thanks Debra! We had only a small amount leftover, but it was indeed delicious! We love our corn-beef and cabbage, we already tried a new casserole, but will be making it again. Hope you have a nice weekend!! This looks like my kind of St. Patrick’s day recipe with the addition of the potatoes. Y’all get some seriously crazy weather in Boston! It makes me so happy to live in East Tennessee and not to have that kind of snow fall. lol This recipe looks yummy & I saved it so I can give it a try. Do you have any tips on picking a good corned beef brisket? I find every time I get one it’s too grisly. Thanks for the delicious shared! Hi Cathy, my tip for choosing a corned beef brisket for this dish would be go to go for the thin cut (also called flat cut) , which has much less fat than the thick cut (also called point cut). Hope you give it a try and enjoy! I always tell my mom to try making corned beef in the slow cooker! She is still all about the stove though! Thanks Rebecca, I hope your mom gives this a try and enjoys! My husband was looking for a recipe for corned beef….I will have to share this with him. Thanks! Thanks AnnMarie! I hope you and your husband give this a try and enjoy! I really like the addition of brown sugar! I love sweet and savory flavors in my meals! I bet this beef is packed with fruity aromas! Thanks Katerina! I’m with you, I love sweet and savory! We will try this recipe! perfect st pattys day recipe!! !